Get a feel of INK on PAPER PRESS with a selection of great photographs ByEmmaJane. 2016 has had an explosive start at INK on PAPER PRESS. I have been busy working with Emma Stibbon RA on prints inspired by her recent trip to Mt. Stromboli. At the beginning of the year I was excited to be asked to work on a print for abstract sculptor Ann Christopher RA to coincide with her forthcoming exhibition Drawing – The Lines of Time at the Royal Academy of Arts. The print will accompany special, limited copies of her monograph Ann Christopher published by the Royal Academy of Arts. Sculptor Michael Pennie has also been in the studio and we are beginning to explore how his drawings translate in print. It is great to have been in talks with more artists recently about potential print projects and I can’t wait to see how they develop throughout the rest of the year – watch this space! Stampa per sposi Marco & Frieda in Italia! 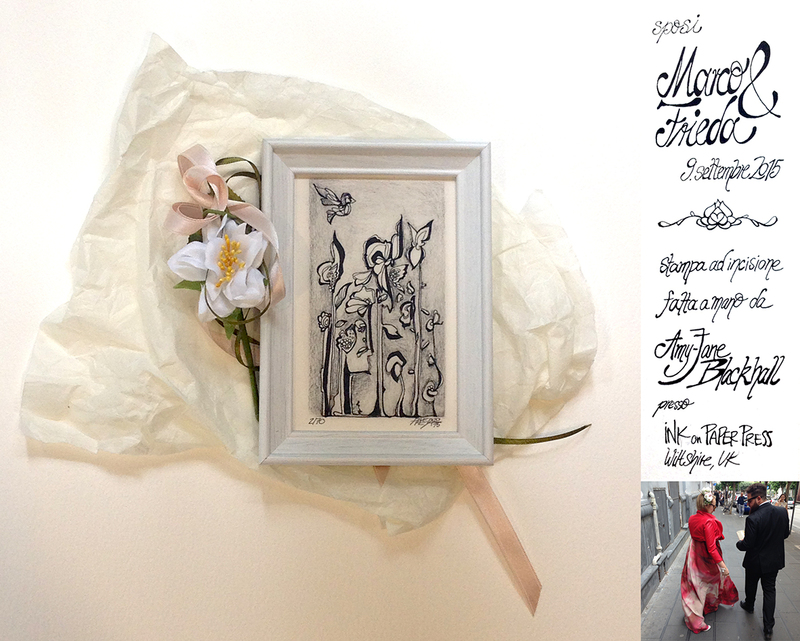 It was a pleasure to print the gifts for the guests attending the wedding of one of my best friends, Berlin based artist Frieda Lohr and Marco Montefusco. I was lucky enough to attend the special day in Italy and I can’t wait to work on more prints with Frieda in the future! End of Summer, hello September! The Summer rounded off at INK on PAPER PRESS with a day in the studio with artist Emma Stibbon RA proofing some new prints for the Royal Academy. My good photographer friend Christina Cornish popped by and kindly offered to take some snaps, see her handy work below. The day ended with a fun BBQ aboard the train carriage with fellow Academician Ann Christopher!